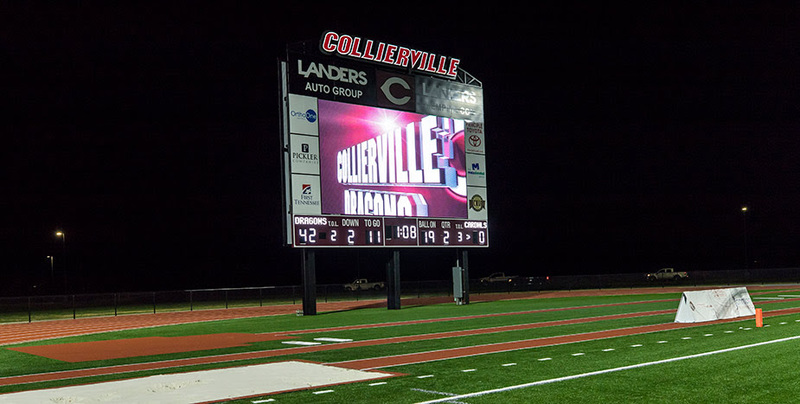 When Collierville High School opened the doors to their new school this fall, included in the additions were four video displays and 12 fixed digit scoreboards designed, built, and installed by Daktronics. The athletes for the football, basketball, wrestling, volleyball, lacrosse, soccer, baseball, softball, and track teams can look to their Daktronics equipment to keep score, run video clips, and more for optimum fan engagement. The school holds special events at the facility, and support from the public through sponsorships ties the community and school district even closer. Measuring 17 ft. high by 30 ft. wide with a 15HD pixel layout, the outdoor video display showcases crisp, clear imagery with wide-angle visibility to fans in every seat at the stadium. Alternately, the main gym’s video display measures 11 ft. high by 16 ft. wide with 10mm line spacing, paired with a fixed digit scoreboard. Sportsound audio equipment accompanies the outdoor display. Multiple fixed-digit scoreboards placed around the campus ensure fans don’t miss a beat. Not to be outdone by cooler weather sports, spring sports such as softball and baseball also showcase video displays in their fields. The softball team’s video displays measures 7 ft. high by 16 ft. wide while the baseball display comes in at 8 ft. high by 16 ft. wide. Both feature 19mm line spacing and are paired with fixed-digit scoreboards and audio systems. Collierville High School will also receive digital content for their display, produced, and delivered by Daktronics Creative Services.